I recently covered some of the trends in touch screen technology. Now, Smashing Magazine just published an article on outstanding recent developments in the field of user experience design. Definitely worth checking out to see the state of the art. Popular Science has a brief piece of what to look for when buying a digital camcorder. 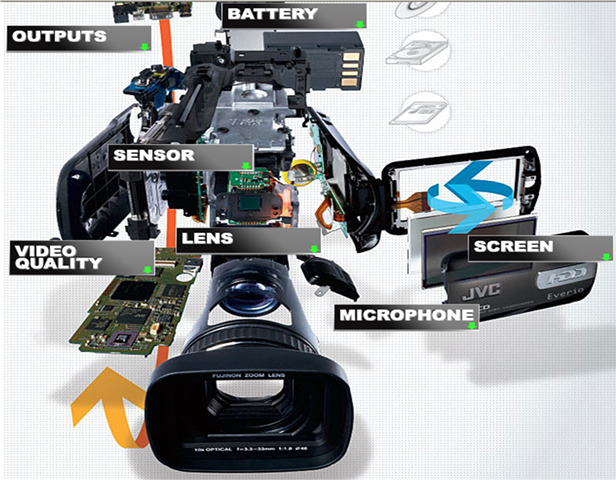 This includes a breakdown of key features by price range and an interactive schematic of camcorder technology. Eye-Fi is selling a wireless memory card that streamlines the uploading process from digital cameras to computers via local wireless networks. Besides the benefits to consumers, this is a convenient method for uploading large quantities of images when returning from field research, especially if multiple cameras/cards were used. Technology Review has an article about MIT's keyword search engine for audio recordings. The software converts audio speech into searchable text. When this technology becomes more reliable and affordable, I expect to see it applied to qualitative data analysis (e.g. interviews and ethnographic recordings). Find out about the upcoming Measuring Behavior (2008) conference. The event will be in the Netherlands next August and "focuses on methods, techniques and tools in behavioral research in the widest sense, from behavioral ecology to neuroscience and from physiology to ergonomics." The cover story from the most recent Design News discusses the science of sports, and the latest bio-mechanical and physiological measurement tools (like where does Jerry Rice actually make hand contact when he catches a football).